David, They both were visually creative in their own ways but it should be quite interesting to see the large prints from each and know they are from a time period in history. I like to view your father’s work as the link in time between Ansel and Galen. It will be a treat for my eyes to see and remember, looking forward to it. As for the checklist, I think most of us photogs start out with the checklist you mention and maybe keep it for several years but some never move on from it. All of the photographers mentioned in the article are remembered and well known for their individualism and not their collecting skills. I think it’s funny how some of the photographers that feel they are the important ones refer to their own readers as dummies and other terms that refer to sub par qualities some photographers might have. We all just do what we love and when we get something good we are happy and at one with ourselves. I don’t think we ever really know our own style until we’re dead. The problem then is do we get look back on it and know? Hi Steve, thank you for the insights. Come to think of it, you are right about most photographers starting with the checklist. I’ve done some of it, but my checklist is not for the purpose of following the famous photographers to the same tripod holes, it is to enrich my writing about the places I went with my dad as a kid, to relive a little and make sure the places are still there that Dad worked so hard to protect. Surprisingly, in most cases they aren’t, at least not in the same shape they were 30-40 years ago. Each place has shown significant wear and tear at the hands of man, some more than others. Some are hardly recognizable and not easily photographed any more. I recognize my ego that thinks, “I’ll go to the Grand Canyon or Yosemite and see if I can improve on what has been done by the masters. Then I will have something to measure my work against.” Many people may have this thought, but it is those that let go of this sort of thinking that make a lasting impression with their work as they find something new and unusual to photograph, perhaps even in the same locations. As you say, the mark of a good photographer is whether he or she outgrows the checklist. On the other hand there are photographers who run their entire operation on ego. I know of one in particular that makes an unbelievable $30,000,000 a year schmoozing celebrities. 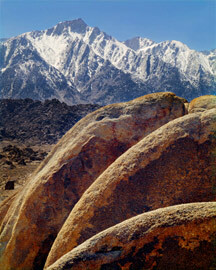 He goes to all the same locations that Dad, Ansel Adams, David Muench and others did. He thinks (just ask him) he has captured better photographs than anyone using the same or close framing as those before him. All of this said, I made what I thought were nice exposures at Point Lobos last year, but I was there mainly to pay my respects to Edward Weston and to get a sense of where the photography classes might have photographed with him. According to many curators and exhibition juries, style is important, not that what they say is the end all, be all. Dad had a strong sense of his own style, perhaps voice is a better word, but I doubt all photographers find theirs in this life, which is a tragedy if they are atheists. Galen Rowell writes eloquently and extensively about developing style. Galen’s philosophy really spoke to me and is what fits my personality the best. In reality though, I choose whichever methods I need to accomplish my goals. Sometimes those goals are to get portfolio-worthy landscapes and for personal enrichment. In those instances, for me it’s usually about chasing the light or a certain type of environmental condition such as flower or fall color. Other times it’s to fill my archive for “stock coverage” or blog material so those are generally with a photojournalistic mind-set. Thank you, Richard. So do you sometimes even while at home start to visualize certain scenes you need and then think about where they might be found and go get them? Is that one part of your process? Sort of I guess in that I research ahead of time or have already been to those places so I arive in time to catch a specific type of light. Interesting Richard. Thank you for giving me/us a peek into what you do. This is a really nice post, and comparison, David. On the surface, I’d say that my photographic style is more like Galen’s than your Dad’s. Due in part to my work schedule, I’m not able to spend a lot of time in the field, so I plan ahead, and visualize what shots I want before I get to a shot, hoping for “epic” light (I am not as fortunate in that sense as Galen was!). However, I think your observation that the styles merge (much like they’re on a continuum) is a really good one. More often than not, especially in the last 6 months or so, I find myself in a location where I’d visualized x, y, and z shots, but once there am inspired by the landscape to go in a much different direction. Its during these times that I create some of my favorite photographs. Hi Greg, thanks for the insight into your method. It is fascinating to me to discuss the approach to making art with various artists. Interesting about your visualizing, yet remaining open to going in a completely different direction when you get to your destination. Without that flexibility, the Galen Rowell visualizing approach could be limiting rather than inspiring as he taught it. From what I have learned about Galen Rowell he was a very powerful and determined individual, but with that he also excelled at being flexible. Having both of those traits is probably part of what made him so good. But a lot of oceanography (my appropriation of the word) allows you to watch the waves for a while to see how they are behaving that particular day. Then I can plan a shot and wait for the waves to fulfill it. I do that quite a bit. Hi Sharon, thank you for that glimpse into how you photograph the seashore. It sounds like you are perhaps in several places along the continuum of where the two approaches overlap, or you have created your own watery way, which is both yin and yang, like the ocean. I remember reading about Ansel’s visualizing a scene and am only just barely beginning to understand it. Like has been posted above, a lot of times I’ve visualized something I get there only to find the light or weather is not cooperating. So I make do with what I’m given, like your father or Steve in his latest blog post. I am finding out so much is just trial and error! I’ve only been chasing the light for a bit over a year and don’t know that I’ve developed a style per se, other than trying to have an accurate representation of what I am seeing and not something overdone or overly manipulated. Hi Derrick, thank you for your comments about style and for mentioning Ansel Adam’s visualization in this context. The visualization process that Ansel Adams placed as the cornerstone of his teaching method and upon which the zone system rested, long before Galen Rowell’s visualizing of photographs, is related but not the same concept. With Ansel Adam’s visualization that I write about in the blog post, “Photography’s Golden Era 4”, he is talking about knowing your medium and materials so well that as you make the photograph you pre-visualize what the finished print will look like, make the corresponding allowances and know ahead of time how to get the finished print to look like what your eye is seeing, as opposed to what the camera will record. Galen Rowell’s visualization involved seeing certain conditions in the field and visualizing them coming together to form a particular arrangement for a good photograph, or even visualizing a certain type of photograph at home and then literally ‘manifesting’ it in the outdoors. Steve Sieren’s blog post is superb writing and photography. Yet as you imply, his process seems to be for all practical purposes, wholly spontaneous and much more like my dad’s process in that he is out there a lot, and gets himself into places that he knows are highly photogenic and then lets nature put on the show. My dad never left home and drove hundreds of miles at the spur of the moment to climb a 13,000 foot plus mountain, but after careful planning and preparation once Dad arrived on location, he would rely on the spontaneity of nature to bring him whatever would come rather than visualizing a particular scene. However, Dad did use his own variation on Ansel Adam’s visualization process for what the final print would look like every time. Reading between the lines I imagine that Steve Sieren used a bit of Galen Rowell’s visualizing too. Hi Bruce, thank you for sharing your process and adding to the discussion.